This standard specifies actions that the owner of a nuclear power plant should take in the event of an earthquake. 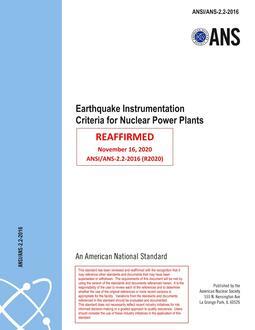 The requirements of this standard supplement those given in American National Standard Criteria for the Handling and Initial Evaluation of Records from Nuclear Power Plant Seismic Instrumentation, ANSI/ANS-2.10-2003. The application of these standards provides a complete evaluation of the need for post-earthquake plant shutdown in a timely manner. This standard also provides guidelines that will enable the owner to develop plant-specific procedures for determining the condition of components, systems, and structures needed for shutdown and criteria for restart when a nuclear power plant is required to shut down following an earthquake. 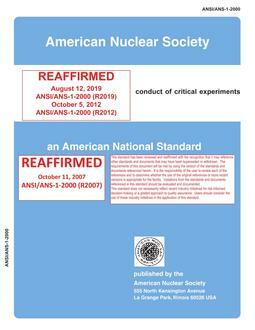 This standard does not cover those operator actions performed in connection with the operation and control of the nuclear power plant following an earthquake. These actions are specified in plant operating procedures, emergency operating procedures, and alarm response procedures.